Ji was such an easy baby. 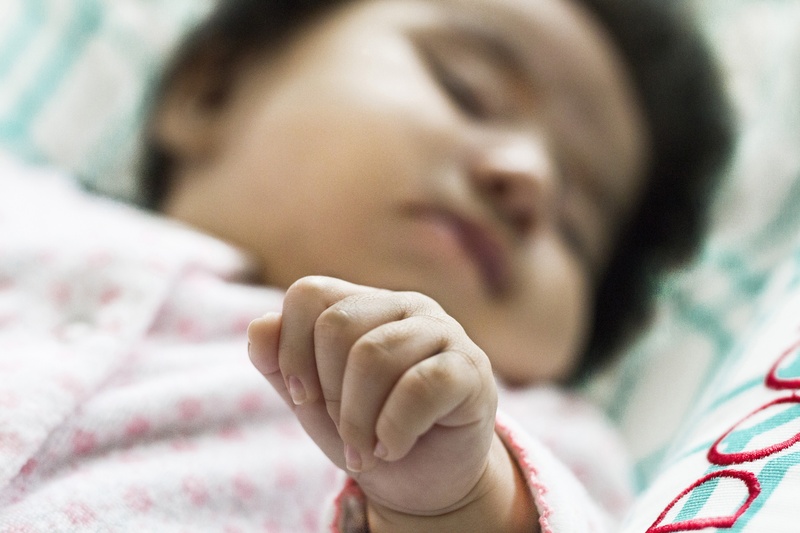 She slept a lot during the day and slept through the night starting at seven weeks. My poor Dahlia wasn’t as fortunate the first few weeks because all she could take were five to ten-minute cat naps here and there. She has a three-year-old big sister and our house isn’t exactly a mansion, so quiet time is very rare around here! I was sleepy and she was sleepy! Everyone kept telling me to sleep when she slept, but it wasn’t at all possible because she never slept…. 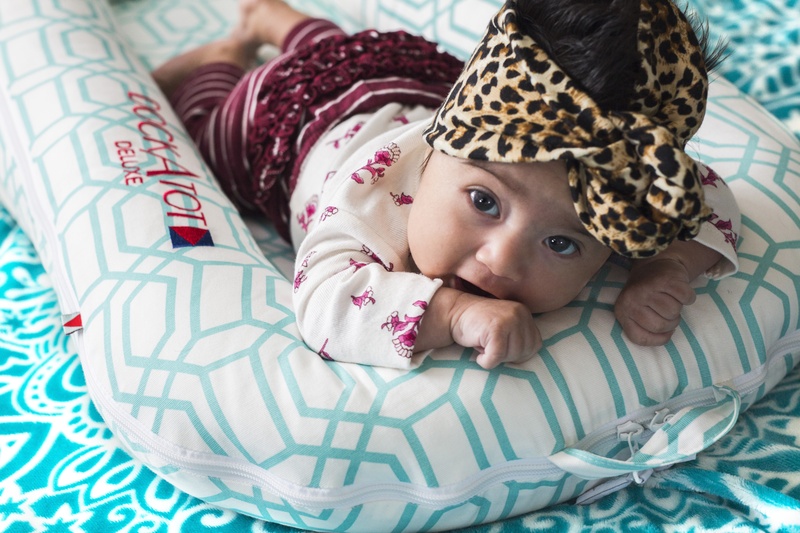 Then, when she turned six weeks old, we received a DockATot to review and I was so excited! Would I finally get to take a nap? I did!!! Dahlia took her first two-hour nap the first day we tried the DockATot. I love it because it hugs the babies body and in my opinion mimics a mommy’s arms wrapped around them while they sleep. She slept so comfortably that I couldn’t believe it. 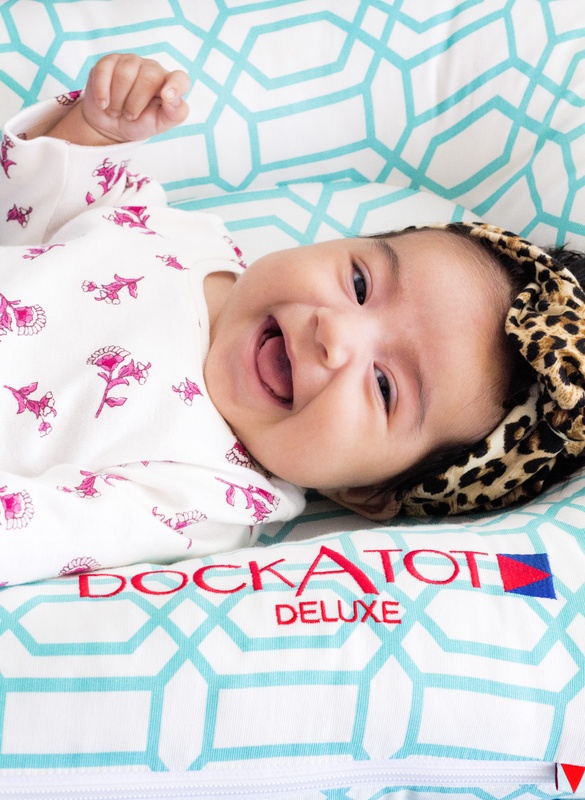 So, what is a DockATot? It’s a multi-functional lounger, co-sleeper, and playtime lounger. You can use it for nap time, to place baby in the bed with you and take with you on the road. As a matter of fact, we are planning on taking it with us on our first overnight trip to visit the grandparents. And, it’s not only for infants. It comes in two different sizes. We have the Deluxe for babies 0-8 months, and it also comes in Grand for kids 9-36 months old. The best part is that it is breathable so if the baby were to turn, they would have plenty of room to breath! My stylish mamas will also be pleased to hear that it comes in different colors and patterns. We are big fans of pastels, so we chose this pretty teal design. Nowadays, Dahlia sleeps through the night in her crib. It’s nice and quite at night but during the day when it’s hectic and loud we definitely bring out the DockATot for napping, lounging and tummy time. A happy baby means a happy mama! I definitely recommend this baby product if you have trouble getting your baby to nap, if you are looking for a safe co-sleeper or if you are looking for a unique baby shower gift. If you have any questions regarding the DockATot let me know! I’ll be more than happy to answer your questions.